As you all know, Verizon, T-Mobile, and AT&T have been working on their own NFC-based mobile payment system known as Isis Mobile Wallet. It’s essentially identical to Google Wallet. Many of us have argued over the last year that these three carriers are simply blocking Google Wallet because they have their own payment system in the works, something that they all deny. While we may never know the complete truth to the story, this latest find by one of our readers who installed Isis on his Galaxy S3 is certainly worth mentioning. 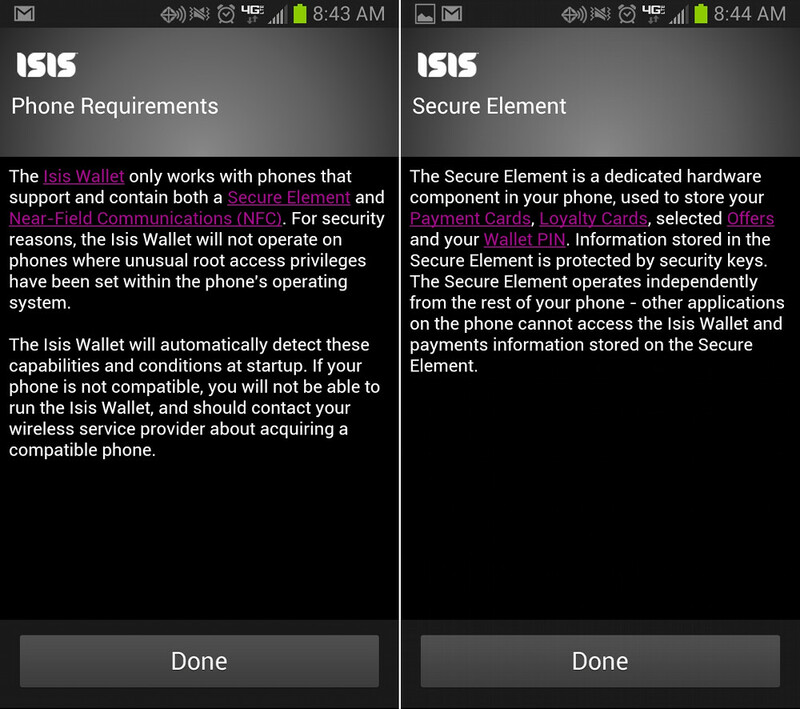 In the screenshots above, taken directly from the Isis Mobile Wallet app on a Verizon Galaxy S3, you can see mentions of the previously talked about “secure element.” In fact, the phone requirements for the app speak of this “secure element” as a “dedicated component in your phone” used to store payment cards and everything else needed to properly run a mobile payment app with NFC. Basically, that’s everything that they said was bad about Google Wallet, and that if Google removed this requirement, that its app could be used on Verizon phones. We had initially tossed out the idea that maybe Verizon was asking Google to add in NFC-SIM requirements to the app, since Isis works with newly created NFC-SIM cards. 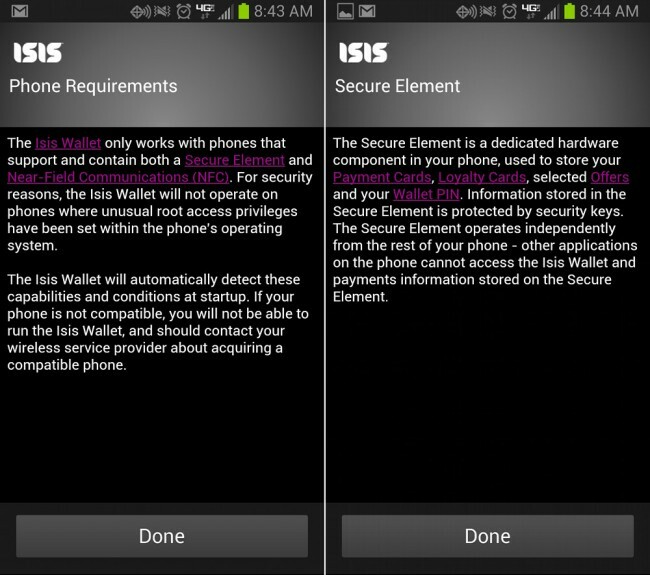 Whether that is or was the case, it doesn’t appear to matter, as Isis will still use the “secure element” inside your phone, which again, is the same “secure element” that Verizon mentioned as the reasoning behind their stoppage of Google Wallet. They clearly are OK with their own mobile payment app accessing this. Look, we could probably argue and complain about Verizon and other carriers’ ridiculous control over smartphones for days, but in the end, these are all just more reasons to think about leaving your carrier and buying an unlocked phone like the Nexus 4. Once you have freed yourself from contracts and the subsidy cycle, your mobile experience will be so much more open and free.